Learn More About This Piece of Equipment! In addition to crane service and crane rental, John Mullins Rigging & Hauling is also proud to use hydraulic gantries in our work. Many people outside of the industry know very little about these innovative tools. We’d like to take this opportunity to educate you more about them and show you what hydraulic gantries are, what they do, and why they might be the right option for your next rigging, equipment moving, or hauling job. Hydraulic gantries are an alternative to cranes. They were originally developed during the 1960s when the press industry had a need for high-capacity equipment that could operate in areas with little headroom. Often, they’re combined with rail systems or wheels to smoothly move objects along a horizontal plane. What Do Hydraulic Gantries Do? 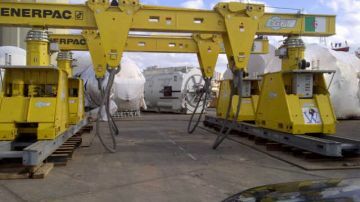 Hydraulic gantries are used to safely move equipment from place to place in areas with little headroom. They are ideal for spaces where a permanent crane system is not possible or when the system needs to be frequently moved from place to place. Depending on the strength and size of the particular gantry, hydraulic gantries can lift and move a wide range of equipment and materials. How Can a Hydraulic Gantry Help You? Unless you regularly work with rigging and hauling, you might not know that you need a hydraulic gantry to manage your rigging job. The good news is that John Mullins Rigging & Hauling is here to help you. We work with a wide range of industries across the Hudson Valley. Simply let us know what you need to move, where it is, and where it needs to go. We can come to your facility and determine the best equipment for the job. Overall, however, we find that hydraulic gantries are the best option where large equipment needs to be moved but there isn’t enough vertical space for a full crane. We can give you more details when we come to do the job. So the next time you need something heavy moved and you’re not sure how to do it, call on John Mullins Rigging & Hauling. Let us show you why we are the Hudson Valley’s first choice for crane service, crane rental, and more. Call or request a quote today to get started!